Whenever there is a study about renewable energy, geothermal energy is one of the energies that cannot be skipped. Here we shall learn so deeply about what geothermal energy is, its history, types of geothermal systems and its uses. The word ‘geothermal’ literally translates to ‘earth’ and ‘heat’ – Heat energy from the earth. Using it as an energy source has several advantages. It is safe, renewable, a source for heat and electricity, and releases far less greenhouse gases than solar panels. The earth’s surface absorbs about 45% of the sun’s radiation that reaches it and reflects the rest back. The remainder is partially absorbed by the atmosphere and partially reflected back to space. At 6-10 meters depth the temperature is maintained at 10-16 C throughout the year and evenly across the earth. Slight changes are dependent on local climate terrain and soil type. The temperature of the earth is also regulated by the magma at its centre. This is resource that is regular and long lasting. First settlers nearly 10,000 years ago chose to settle near hot springs. Ancient Romans used the water for bathing, cooking and medicinal purposes. They used the water to heat their homes too. Geothermal energy was first used commercially in 1830 in Hot Springs Arkansas by Aka Thompson when he charged $1 for the use of a hot spring bath. During the latter half of the 1800s, hotels and spas came up around The Geysers in San Francisco California. In 1892, 200 homes and 40 businesses in Boise Idaho were provided with the first district heating system that is functioning till today. The Larderello fields in Italy were owned by Prince Piero Conti who attached a generator to a naturally driven steam engine and produced electricity to light 4 bulbs. By 1911 and then the world’s first geothermal plant was set up providing 250 Kw. It still works today producing 405 megawatts of power. The Geyser Resort Hotel in California was the site of the first geothermal plant in the US, built by John D. Grant in 1922 and generated electricity for the entire resort. In 1960, Pacific Gas and Electricity began operations of the first successful power plant in The Geysers and today there are 21 geothermal power plants in this area currently owned by the Calpine Corporation and Northern California power agency. By the 1950s water source heat pumps were designed for residential purposes and by 1980s these were improved to geothermal heat pumps and the technology continues to evolve today. Today over 20 countries generate geothermal power. In 2008 it was estimated that geothermal energy accounted for 1% of the energy generation. By 2050 it is estimated to grow to provide at least 10-20% of the world energy. 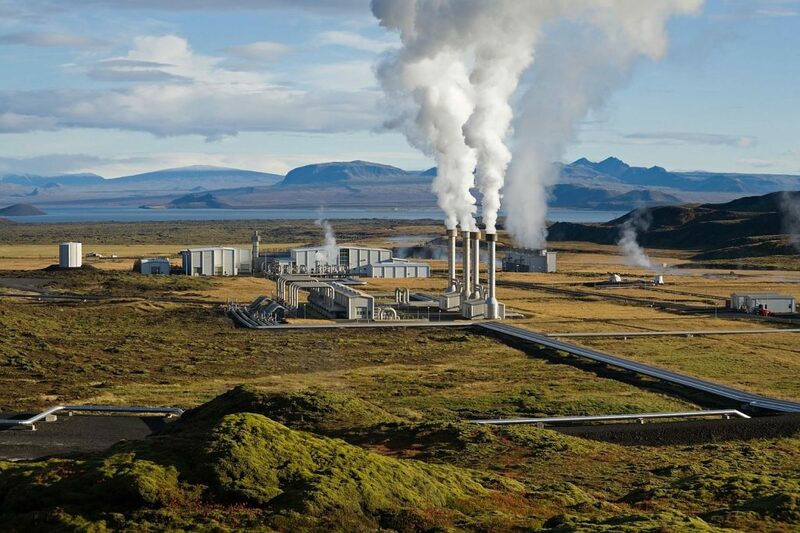 Dry steam – these were the first kind of geothermal power generation plants to be built. They were built in Larderello, Italy and at The Geysers, Northern California. The proponent used here is steam. The excess steam is released with very minor amounts of other gases. No fossil fuels are used to run the turbine. Flash system- when hydrothermal fluids are available at temperatures above 182C (360F), flash systems are used to turn the turbine. The liquid at high pressure is sprayed into a low pressure tank and immediately vaporized. This steam is used to power the turbine driving the generator. The remaining liquid can be flashed in a second tank thus extracting more energy. Binary systems- the geothermal liquid found in many places is less than 210C and it is used on combination with another liquid or a “binary” which has a lower boiling point than the geothermal liquid. The two liquids do not come in contact, but the heat is transferred to the binary liquid, vaporizing it and this is used to power the turbine. This is the more common type of geothermal plant being built now. This is the technology using hot water closer to the earth’s surface directly to heat buildings, streets and sidewalks, found near reservoirs that have a moderate temperature of 20-150C. These systems are primarily located in the western United States. Very little external energy is used and the percentage of pollutants released is also very less. Green houses and food processing units too are benefitted by this system. Direct hot water is also supplied to communities. Fluid is circulated in the loop and sent to the geothermal heat pumps. When warmth is required the liquid absorbs the earth’s heat and when a cooling effect is desired the excess heat of the building is released into the earth. The conditioned air is then directed by the heat pumps into the building. A supplementary advantage of this system is hot water can also be supplied to the building using the same loop. During the heat exchange, the excess heat from the building is transferred to its hot water system before reaching the ground loop. No additional energy is required to heat the water and no gases are released as everything is in a closed loop. It makes the whole system more efficient. Heating the sidewalks and roads to melt snow. Heating for green houses to grow vegetables, flowers, seedings etc. Running aquaculture operations to raise fish, shrimp, tropical fish and other species. Resorts and spas in tourism industry. The potential of geothermal energy is huge and can be used globally. As the energy needs of the world increases alongside the threat of global warming, geothermal energy is now being used as an alternative to burning fossil fuels. The cost of building the plants are still high, but with advances in technology and processes, it can be brought down to affordable levels. It is a cheaper resource as it does not need the transport of raw materials or management resources. It is a leading choice for alternate energy.